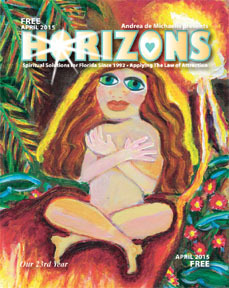 Hello and welcome to the April 2015 edition of Horizons Magazine. It feels good to be back in the gym on a regular basis again. It’s too easy to get out of the habit, to tell myself that I need to do computer work instead, or that my yard work constitutes a workout. When I do the gym first thing in the morning before I go into the office, that lets my work day flow more freely and it’s a more productive and satisfying day. And my life is all about what satisfies me. I’ve learned that changing a habit is as simple as training myself to have discipline over where I chose to place my focus. When I immerse myself in the world of that which I strive to be, I attract the circumstances and events that support my vision. If I want to get fit and strong, I’ll spend more time in the gym or Googling to learn about muscle structure. I’ll spend less time watching cooking shows or cat videos and talking with friends about fashion. Staying focused and on purpose helps me attract what I want. It’s up to me. Why do some attract kindness and others attract aggravation? It’s been a fun and productive month. I’ve gone to the gym every day, as well as working out at home. I began clearing the underbrush of my woods, a major raking job. My arms and shoulders are getting strong! I’m ready for change, which is one reason I cut a new trail each season. I mused that clearing a path is like clearing any path in life: you get a glimpse down a different road and want to explore it a little. On your way to do that, you have to brush your way past old, dried debris. I find whenever I clear out a new space, new things start happening. I feel freer, more expansive and capable of more. And the more I cleared, the more everything in other parts of my life seemed to fall into place as well. This morning I lucked into two friends with a chainsaw and they cut and stacked two dozen bamboo for me. I seem to “luck into” a lot of good situations, a friend remarked the other day. But it’s not luck at all. It’s that I have an optimistic and hopeful attitude and believe it’s possible for the best to happen to me. She’s “more practical,” she says, and is always on the look out for what to avoid. She anticipates getting a cold each season and she gets one. She anticipates the driver cutting her off, and the drive-thru getting her order wrong. We spent a few hours recently side by side at the same event and had two completely different experiences. It all boils down to what we expect from life and what do we believe is possible for us. So why do some attract kindness and generosity and others attract aggravation? It all boils down to what we expect from life and what do we believe is possible for us. “Sure you say that,” she said, “everything goes right for you.” Is it luck or is it that I expect and believe life to support me? Is it that I strive to make the best of trying situations and, knowing it’s all related, I engage only in activities that I don’t mind coming back to me on a karmic wheel of return? At this point, I live my life in such a way that there’s not too much left in motion to come back and smack me with. I learned that if I left something unresolved, I’d get that lesson over and over in the form of new people and situations. When I figured out how that worked, I cleaned up my act. So now, when I feel change is about to happen, I don’t fear it, I’m not worried about what is going to come back to haunt me. I’m not afraid to initiate change by clearing my garden of tangled undergrowth because I know it means I’ll have less to trip myself up on. One thing that always upgrades when I do a major clearing out of my physical world is that dollars begin flowing more freely. Just yesterday before the work day began, I affirmed the Universe would provide what I wanted to put into my bank account for the day. $1,350 I said aloud and the man said “it’s already done.” During the evening review of the business day, he asked how I did. I added it up. $1,158.30. Some say I’m a lousy business person because, except for a few months ten years ago, in 23 years no one sells ads for the magazine. The most I make ad calls is never, but a few times a year I’ll create an ad out of the blue on a whim. I woke up one morning last week thinking of a particular business who has never advertised with me, ever. I checked out their website. It related to an article I’ll publish next month, so I created an ad for them just for the fun of it. I emailed it with a note and within hours, they purchased my last minute full page ad space. An hour later, a former advertiser emailed me for a copy of her paid 2014 invoice. When I sent it to her, I included a note and a new little ad I created. She booked the ad for six months! In the afternoon, a galpal asked for a copy of her unpaid invoice, which I’d forgotten was outstanding. She not only paid, she wants an ad for the April Horizons. My intent and attitude all month has been, “I wonder what exciting new person might call for an ad,” and “I wonder from what unexpected source today’s dollars will come?” I do that on purpose when I am up on my publishing deadline and have ad space to fill. I take stock of what space I have available and translate that into a dollar amount, then I set my intention to bring in that amount by deadline. On these deadline days, I make a point to ask myself several times an hour, “I wonder what exciting new person might call for an ad,” and “I wonder from what unexpected source today’s dollars will come?” I ponder for a few moments the last time unexpected dollars came to me, and how cool it feels when new advertisers find me. I bask in the good feeling of the memory for a few moments and remind myself I can feel that again, I can have that feeling again of new people and dollars flowing. Then I go back to working on what is fun to do — which last month has been clearing my woods. I’ve learned that when I create something just for the fun of it, I’m rewarded with dollars whether I “work” for them or not. Our Mataji, beloved guru H.H. Ma Yoga Shakti Saraswati Maha Mandleshwar, passed on to the next stage of her journey and entered Mahasamadhi February 20, 2015. When we check out of our physical bodies, our work can take on a new dimension. When we die a physical death, when we pass from this Earth plane, we move on to the next where we survive in consciousness and continue what we incarnated to do. Knowing this, grief doesn’t have to be grim. “How does it feel now that she’s gone?” I’ve been asked. It’s hard to find words to express what it feels to lose someone I’ve never lost. I cannot grieve when I know there is no separation. My mother passed in 1996, but there’s been no grief as I still feel her with me. I know that’s how it works. . I was drawn to move from Miami in 1983 and have my home built just 6.9 miles from Mataji’s Palm Bay ashram, the Yoga Shakti Mission. She was a disciplined teacher. She did not coddle; it was all about taking what you learn and doing practical work with it in the world. The guru/disciple relationship is a very private, internal, subjective relationship. It goes beyond darshan and satsang, beyond having conversations and attending events. There is an inner connection made strong through daily meditation and internal dialogue. In meditation, you are essentially practicing a separation of consciousness to enable you to experience your existence apart from your physical body. In doing so, you come to know the Universe as being responsive to your thoughts and internal dialogue. 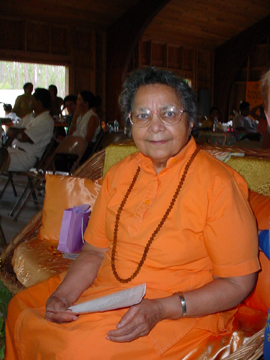 Mataji remains as available to me now as she’s ever been, and as available as I am to her. This entry was posted in Uncategorized on April 1, 2015 by Andrea.